Patrick said lawmakers "created that framework" needed for this project to move forward. "Several pieces of legislation created the framework for this and other projects. The Green Communities Act, which was signed in 2009, the Global Warming Solutions Act, there is another bill I signed last summer which enabled the long-term contract that makes the financing for these projects work," Patrick said. The Hoosac Wind Project on Bakke Mountain in Florida and Crum Hill in Monroe is nearly complete with 19 turbines generating a combined 28.5 megawatts of electricity – estimated to provide enough energy for 10,000 homes. The project continues the Patrick administration’s goal of creating 2,000 megawatts of wind power by the year 2020. This project has taken nine years from its initial proposal. It was held up with litigation after abutters and environmentalist groups fought wetlands permits in 2005. That lawsuit lasted until the end of 2010. The special permits were extended twice by the towns, who had supported the project since its 2003 proposal. Patrick said that the key to turning the idea into an actuality took partnerships with the state and municipal governments, the private sector and advocates. The state has worked along “all of the lines that divide us” to come together behind the common cause of reducing the carbon footprint and the state’s dependence on fossil fuel, he said. Patrick said lawmakers “created that framework” needed for this project to move forward. “Several pieces of legislation created the framework for this and other projects. The Green Communities Act, which was signed in 2009, the Global Warming Solutions Act, there is another bill I signed last summer which enabled the long-term contract that makes the financing for these projects work,” Patrick said. “Our clean energy future is being realized here today with this project and so many others across the Commonwealth,” Hunt said. The contract is the “gift that keeps on giving,” said Kevin Lynch, vice president of external affairs for developer Iberdrola Renewables. Construction of the farm created 140 jobs and led to the spending of nearly $4 million in the local economy, he said. From now on, the company will be paying the taxes and leasing from the landowners, he said. During the course of the 20-year lease, officials are expecting about $6.8 million in tax revenue for the towns and $3 million in lease payments. But while there were cheers all around for the speakers, outside of the speaking event Florida resident Michael Fairneny and others held signs in protest hoping that the project would eventually be shut down. The celebration was protested activist groups opposing wind project. Michael Fairneny, of Florida, was joined with protestors from as far away as Cape Cod. “You can see the wind turbines right from my house and I am worried that I’m certainly going to hear them. It’s not only audible sound, it’s inaudible sound, low-frequency sound that has been reeking havoc with people across the state,” Fairneny said. Health concerns about the noise are of concern for Fairneny but the bigger worry is that the environment near his home of more than 30 years has been altered. “I wanted to leave this for my grandkids and their grandkids. I’m worried about having to move our of my own homes. Another concern is the property values. Most of my accumulated wealth is in my home,” Fairneny said as he began to tear up. 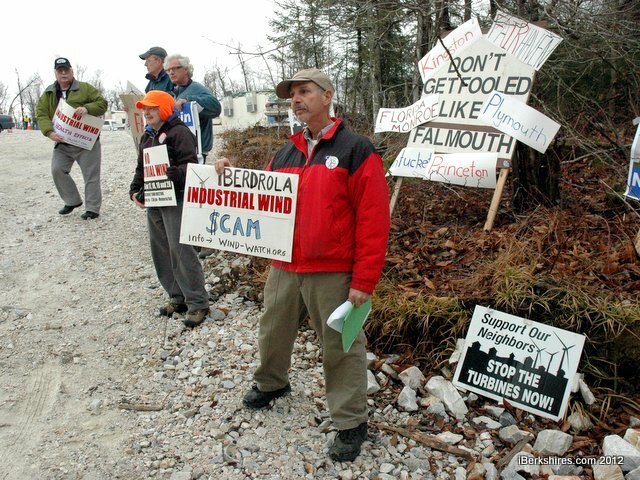 One Falmouth resident confronted the Governor as he arrived shouting “Falmouth needs a better Governor” and pleading for Patrick to shut the whole project down. Also speaking at the commissioning were Secretary of Energy and Environmental Affairs Richard Sullivan, President of Iberdrola Renewables Martin Mugica, Vic Abate, of General Electric Renewable Energy – who built the turbines – state Rep. Gailanne Cariddi and state Sen. Benjamin Downing. Ed Bond, CEO of the construction firm Bond, who installed the turbines, presented Patrick with two hard hats to commemorate the occasion.